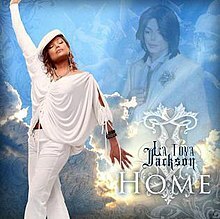 "Home" is a sentimental ballad by La Toya Jackson which first appeared on the 2003 promotional copy her album Startin' Over. Jackson released the single on July 28, 2009 in dedication to her younger brother, Michael Jackson, who died on June 25. All proceeds will go to AIDS Project Los Angeles, one of Michael's favorite charities. "Home" is an autobiographical song describing life in the Jackson family and the closeness once shared among Jackson and her siblings. A press release describes the song as being "written with affection about her childhood memories and based on the premise that no matter where you are or what you are going through in your life, you can always go Home." It is notable for a bursting refrain reminiscent of the achingly climactic verse heard in Simon and Garfunkel's signature tune "Homeward Bound." The lyrics hint at Jackson's exile from the family in the early 1990s when she was under the control of abusive manager Jack Gordon. Jackson expresses remorse over the "many years that we let pass" having been "parted by the fame we grew to only know." The song alludes also to La Toya's affectionate pet name for Michael, "Joker." "Home" was originally not intended to be a single. A different song called "Love, Honor and Obey" was announced in March 2009 to be the lead single for Jackson's long-anticipated album, Startin' Over, which was completed in late 2008. In light of Michael Jackson's sudden death, Bungalo Records put it on hold in favor of releasing "Home" as a charity single in support of one of the singer's philanthropic causes. Jackson filmed a music video, her first in over twenty years, on July 26, 2009 directed by Eric Bute with cinematography by Reed Smoot. The clip was shot at Disney's Golden Oak Ranch in Santa Clarita, California. The video was released online via iTunes on August 31, 2009. Access Hollywood officially debuted the clip on September 1, 2009. The video features Jackson both as a child and as an adult in various tributes to her late brother such as climbing trees, blowing bubbles and playing on a tree swing. As Jackson sits on the branch of a large oak tree, she can be seen holding a programme given out at the Michael Jackson's memorial service on July 7, 2009. ^ "LaToya song re-released as Jackson tribute - Entertainment - Celebrities - TODAY.com". MSNBC. 2009-07-17. Retrieved 2012-01-11. ^ "APLA in the News". Apla.org. 2009-08-13. Retrieved 2012-01-11. ^ Michael Jackson (2009-08-13). "La Toya Jackson: "We're Doing the Best That We Can"". E! Online. Retrieved 2012-01-11. ^ "La Toya Jackson Releases First Video In 20 Years: "Home" Debuts On Access Hollywood and On iTunes With Proceeds Going To APLA". Prweb.com. 2009-09-01. Retrieved 2012-01-11. This page was last edited on 10 December 2018, at 20:57 (UTC).